Slimline 1/4 Glazed Counter unit. Comes with Glass display area. W 122 x D 44 x H 96 cm. Slimline 1/4 Glazed Counter Unit with 5 mm. toughened glass topand display area. 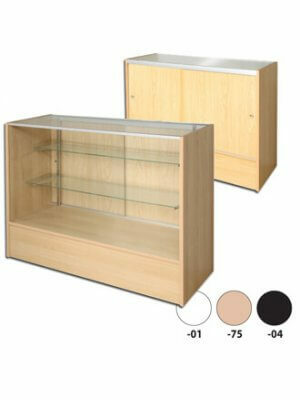 The unit comes with sliding wooden doors to the back, offering a handy combination of merchandise and storage space. Combine the unit with the other slimeline units and create your own counter.